Some Hell is a terrifying treat - bleak and sad and beautiful all at the same time. Reading it is like sitting the cold and finding yourself trapped between numbness and burning. Colin's disgust with his body, his attraction to men, and his willingness to submit is especially heartbreaking. It's like Bill Clegg's Did You Ever Have a Family, but instead of a story of grief after the death of a loved one, it's about the shame, guilt, and regret that follow. An amazing debut from an amazing writer. A devastatingly beautiful read. I think hearing the author speak about the book before reading it helped me really grasp what he was doing here. Most of this novel is so surreal it feels like a dream within a dream. Simply put, I love deep, dark, queer novels and this is EXACTLY that. I love books that delve into a mother-and-gay-son theme. While the ending left me a little empty at first, I quickly realized that Nathan spoke about playing with a David Lynch inspired world full of insane clichés but with a crazy twist, and that’s exactly what he did. In fact, it felt incredibly like watching Mulholland Drive. Colin’s family is dissolving in the aftermath of his father’s suicide. While his mother, Diane, retreats into therapy and cynicism, Colin clings to every shred of normal life. Awash with guilt, he casts about for someone to confide in: first his estranged grandfather, then a predatory science teacher. Shunned by his siblings and rejected by his homophobic best friend, Colin immerses himself in the notebooks his father left behind. Full of strange facts, lists, and historical anecdotes that neither Colin nor Diane can understand, the notebooks infect their worldview until they can no longer tell what’s real and what’s imagined. 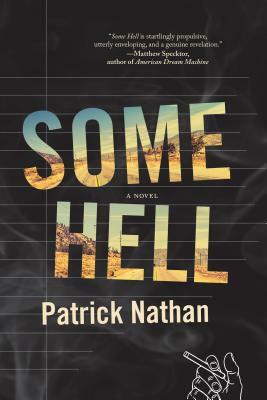 A novel of aching intensity, Some Hell shows how unspeakable tragedy shapes a life, and how imagination saves us from ourselves. Patrick Nathan’s short fiction and essays have appeared in Gulf Coast, Boulevard, the Los Angeles Review of Books, and elsewhere. This is his first novel. He lives in Minneapolis.